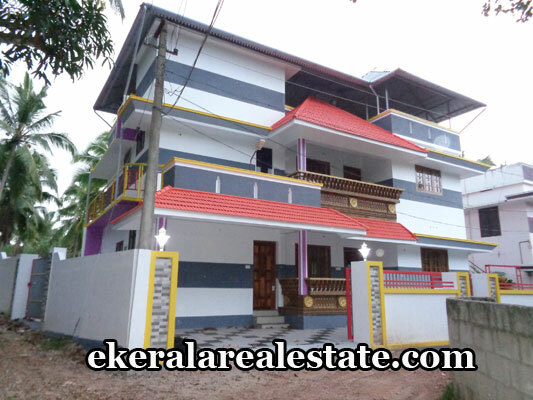 House located at Mangattukonam (Kariavattom – Bypass Road). Land area : 5 Cents. 2100 Sq.ft. 4 Bedrooms (4 attached), 2100 sq.ft. 2 hall, 2 kitchen, terrace roofed. Wood : Pincoda / Teak. Materials : Branded good quality materials are used. Kitchen and Bedroom cupboards available. Bus Stand – 50 meter. Kazhakuttom – Venjaramoodu bypass road – 1 km. Kariavattom NH 47 – 2 km. MC Bypass Road – 1 km.